* When is the best time of the year to prune trees here in the valley? For deciduous shade or fruit trees (those that lose their leaves in the Fall), late November through February is the best time to prune, while the tree is dormant. However, proponents of spring/summer pruning of deciduous fruit trees believe trimming at the time of fruit formation has its benefits. Now is also a good time for pruning redwoods; wait until spring, though, to prune pine trees. * Is it necessary to prune trees? Only if you have a good reason to do it. Those reasons include: to remove diseased, deformed or dead wood; to remove crowded or crossed branches; or, to cut back branches that are rubbing against the house or roof. Don't pick up your pruning tools if: you need firewood in a hurry; you're mad at the boss, and need to take out your aggressions; or, everyone on the block is doing it. * What tools do I need for pruning? Use hand pruners (pruning shears with a curved blade) for branches less than one-half inch thick; for slightly larger branches, use long-handled loppers; and for branches over an inch thick, use a coarse-toothed pruning saw. Use a sturdy, specialized ladder for reaching the higher tree branches, such as an eight to ten foot-tall, three-legged ladder. The household stepladder is not a safe choice. * How far back should I prune my deciduous fruit trees? The latest trend for backyard orchardists: keep your fruit trees no taller than you can reach. All the fruit above your extended arms, after all, is for the birds. For fruit trees five years old and less, this is fairly easy to do. For older, taller established fruit trees, remove one-third of the total tree height each year until the desired height (under ten feet) is achieved. * How much of a branch should I cut? Never cut back a healthy branch of any tree by more than one-third its entire length. 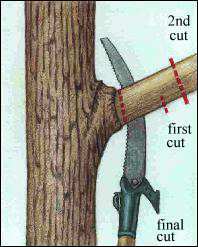 Don't make a "flush cut" (removing a branch right next to the stem). Leave the nub or "branch collar" that protrudes out less than an inch from the stem. That area contains the chemicals necessary for the tree wound to heal. If in doubt what to cut, especially when the branches are out of easy reach, don't hesitate to call in a tree pruning professional. * How Do I Prune a Thick Branch? *Cut number one: make a cut halfway through the underside of the branch to be removed, about one foot out from the collar where the branch attaches to the main stem. *Cut number two: Saw through the top of the branch, about two inches farther out from cut number one. The branch should give way about half way through this cut, with the undercut portion preventing any damage to the tree along the stem. *Cut number three is the clean up cut, sawing through the remaining stub of the branch you want to remove. 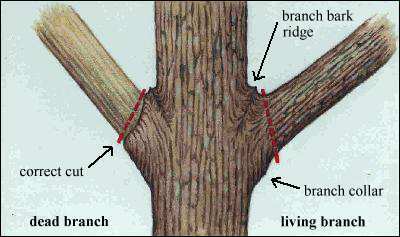 Make this cut close to the collar (the enlarged portion encircling the branch that attaches to the main stem) but do not make the cut flush with the stem; damage to the vascular system (a tree's pipeline for nutrients) may result. * My tree has a lot of mistletoe in it. Should I remove all the branches that have it? 1. Topping removes so much of the tree's crown that it temporarily cuts off its food-making ability. Good pruning practices rarely remove more than one-third of the crown. 2. Topping suddenly exposes the tree bark to the sun, possibly resulting in scalding to the tree trunk and any surrounding (and formerly shaded) shrubs or lawn. 3. The large stubs that are left after topping expose the tree to an insect or disease invasion. 4. Any new limbs that sprout after removing a larger limb will be more weakly attached. When the next wind and rain storm hits, it will be these branches that may land on your car or house. 5. Trying to control a tree's height by topping? Those new limbs that sprout will be more numerous than normal, so the tree returns to its original height in a short time with a far denser crown. Again, storm damage may result. 6. A topped tree is an ugly tree that will never regain its original grace and character, robbing you and your neighbors of a valuable asset. 7. Topping may be easier and cheaper than applying the skills and judgment necessary involved in good pruning. However, the hidden costs of topping include reduced property value, the expense of tree removal if the tree dies, the risk of liability from weakened branches and the loss of other trees, shrubs and lawn if they succumb to the dramatically increased sunlight. * How much of a tree should I prune if it has mistletoe? Many of the ash, silver maple, walnut, locust, oak and cottonwood trees that inhabit our area are infested with mistletoe, an evergreen, parasitic plant. Although it may look harmless hanging in your hallway during the holidays, mistletoe in trees is slowly killing your source of summertime shade. It may take years to kill a tree; in the meantime, mistletoe makes them more susceptible to drought and disease. Mistletoe does its damage by sprouting root-like structures (called haustoria) which enters the growing tissues of limbs, robbing the tree of water and nutrients. It is spread mainly by your local neighborhood birds who carry the sticky mistletoe seeds to trees in newer residential areas from old trees along stream banks and from established neighborhoods and parks. Removing and controlling mistletoe in the winter is not an easy task. Usually its located high up in trees, reachable only by birds, squirrels and junior high schoolers. But instead of arming your fearless 12 year-old with a pruning saw, it's safer to hire a reputable tree service to do the removal. If you're doing your own pruning, try to remove more than just the mistletoe; cut off the suffering limb one foot or more below the point of mistletoe attachment. However, even if all you can reach is the mistletoe itself, it is better to remove that than to do nothing at all. It will take several years for the mistletoe to get back to a size where it will produce seeds. After removing the mistletoe, try wrapping that area of the tree branch with black plastic. That will help stop any resprouting. But you may have to replace the black plastic on a regular basis; it's the lack of light that keeps the mistletoe from regrowing. Chemical controls that contain the plant growth regulator ethephon, such as Monterey's Florel, may provide some mistletoe containment. However, the University of California says that applications may only provide temporary control and mistletoe may soon regrow at the same point. The most effective means of mistletoe control? Dig out that infected tree and plant a mistletoe-resistant tree, such as the Chinese pistache, ginkgo, golden rain tree, liquidambar, London plane tree, sycamore or a conifer.